Overwatch’s 1.29 patch has now been pushed to the live game. The big highlight is a pretty major rework to Torbjörn – everyone’s favourite Swedish engineer has a new area-denial ult, a self-armouring buff, and deploys his turret very differently. The scrap mechanic is entirely gone, which should hopefully make him more flexible. Pharah has also had a pretty major overhaul to her primary fire – check it out below. Elsewhere there are some minor but still impactful tweaks to other heroes – Brigitte’s shield has had a slight nerf, while Soldier: 76 and Orisa’s primary fire have both had small buffs. In exciting accessibility news, a range of colourblind options have made available for you to customise your UI. Naturally, there’s the customary cavalcade of bug fixes. Torbjörn’s new ult has already provided plenty of memeable moments, such as one occasion where a Genji deflect managed to turn all its lava against the Torbjörn’s own team, melting them all as they tried to advance a payload. Fun times. If you’d like to check in on the current PTR, here are our Overwatch 1.30 patch notes. Patch 1.29 is live now! Go enjoy Torbjörn’s fiery new ult. You’ll now be able to customise how team colors display in your UI (e.g. nameplates, HUD, health bars) and hero outlines with a set of nine different colourblind-friendly colours. You can choose to colour enemy and friendly UI separately as well. These options can be found under Options > Video > Color Blind Options. All changes made will be saved and ready for you to see in the next match you play. Developer Comments: Orisa spends a significant amount of time firing her Fusion Driver from a relatively stationary location, and the weapon’s spread value caused it to feel too random when leading targets at a distance, taking into account the projectiles’ travel time. We’ve tightened the spread slightly, which should leave her close- and mid-range damage potential largely unchanged, while making it feel better to try to hit targets at longer ranges. Developer Comments: Soldier: 76’s damage output was a bit low, but not too far off from where we feel it should be. Making it take a few more shots to reach max spread smooths out the weapon spread curve and should help his damage be more consistent. 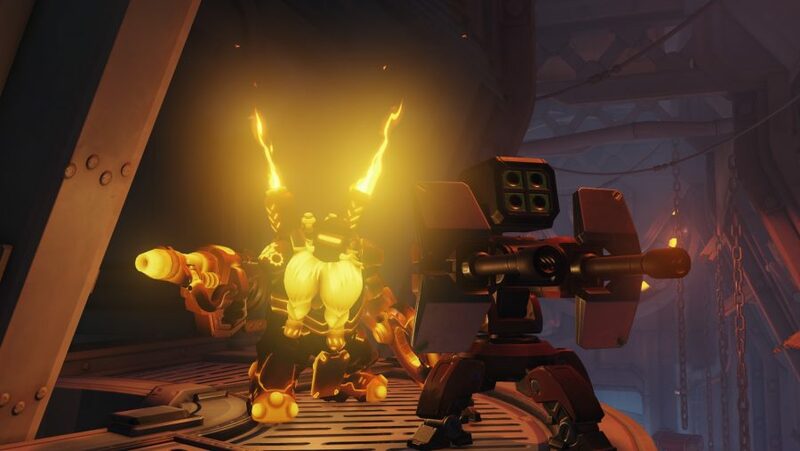 Developer Comments: Torbjörn was initially designed to be a specialised hero, intended as a strong defensive option due to his armor-generating capabilities and ability to control areas with his turret. However, the scrap collecting and Armour Pack mechanics have caused issues through their feast or famine nature. In order to make the hero more flexible in a wider variety of situations, we’ve removed the scrap system, made the turret much easier to deploy, replaced the Armour Pack ability with Overload – a powerful self-buff – and transformed Molten Core into a powerful new area denial ultimate ability.